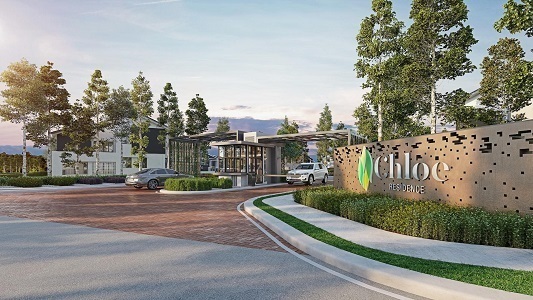 Inspired by beauty and coupled with tangible values, Chloe Residence is the latest sanctuary that occupies 12 acres of Emerald West in Rawang, a fast-growing township that provides a sense of exclusivity surrounded by lush greenery. Part of the Emerald Rawang neighbourhood which has been there since 15 years ago, the township has approximately 2,500 families living there. 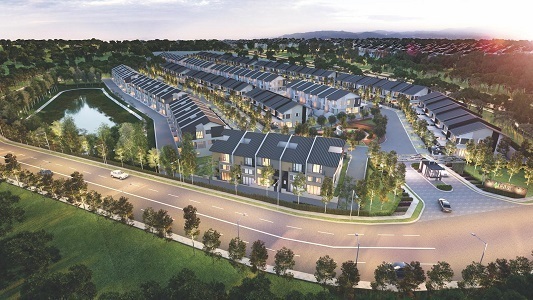 Developed by GuocoLand (Malaysia) Berhad, one of the nation’s notable property players, this new project consists of 142 units of 2- and 2.5-storey terrace houses. Accompanied by beautifully designed homes, Chloe Residence also promises great connectivity and convenience that is suitable for families who value modern living. 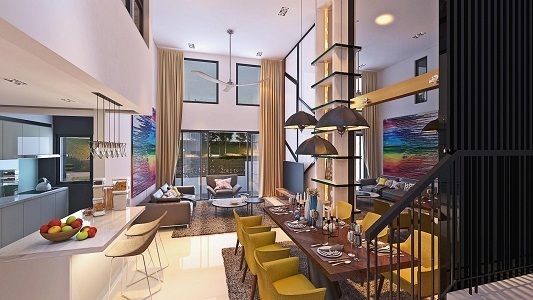 A freehold development, Chloe Residence offers a few types of terrace houses to cater to buyers’ preferences. Type A has a built-up size of 1,977 sq ft and Type B is designed at 2,113 sq ft. Meanwhile, Type C, the most spacious layout available, is a courtyard home that is sized at 2,287 sq ft. As for the number of bedrooms and bathrooms, each unit features 4+1 rooms and 3 bathrooms. With modern vernacular aesthetics, the houses are carefully designed to enhance the practicality of space, which helps in furniture arrangement. To improve indoor environmental quality and reduce the use of electricity, the design of the unit promotes natural ventilation and lighting — a great way to save the environment. Apart from being surrounded by the lush greens, residents’ privacy can also be assured as there are only 12 units per acre, which makes the place’s density low. 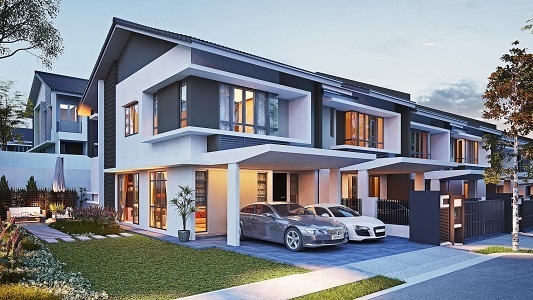 Targeted to be completed by December 2019, these homes are priced from RM638,000. 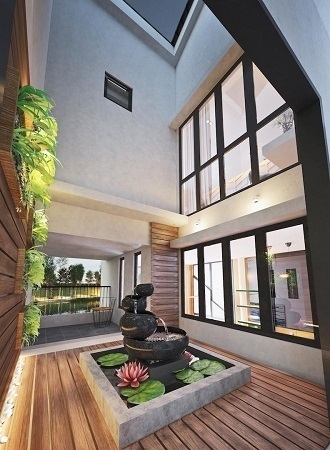 At Chloe Residence, one gets to enjoy the comfort of its surroundings that is complemented with lush landscaping. 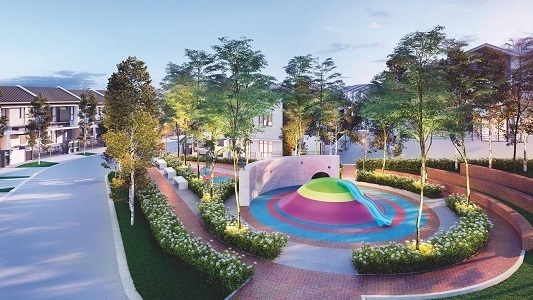 On top of that, for a fuller living experience, Chloe Residence offers facilities such as a playground, a community lawn, a BBQ corner and a basketball court. There is also a lake adjacent to the homes, with a jogging track within walking distance. Additionally, there is also a pocket park for children that is located near to the guard post for wider public surveillance. Other than that, Emerald Rawang has an upcoming master plan for a 350-acre mixed development. This plan comprises a central park with multiple lakes, a recreational centre and a commercial centre that are conveniently tucked in between the already matured 1,000-acre Emerald township to promote a lifestyle-centric community space for the residents of Emerald Rawang. As for overall security, the place provides anti-climb fencing. The access into Chloe Residence is restricted by only one main entrance, which promotes security for the neighbourhood. Located at a quiet and peaceful residential neighbourhood in Rawang, Chloe Residence is near to some major highways such as the North–South Expressway (PLUS), Kuala Lumpur–Rawang Highway, New Klang Valley Expressway (NKVE), Kuala Lumpur–Kuala Selangor Expressway (LATAR Expressway) and Guthrie Corridor Expressway (GCE). Due to this, residents here are always within easy reach of the city’s hotspots. From Rawang Toll, one can conveniently travel to Sungai Buloh (13 km), Kota Damansara (23 km), Damansara (25 km) and Subang Jaya (26 km). Not to mention, with the new Emerald Rawang link road between Emerald West and Emerald East, the access time to reach the main Batu Arang Road and Rawang toll will be cut down tremendously. Plus, this will also bring residents from both Emerald West and Emerald East closer together. Moreover, this neighbourhood is also adjacent to a myriad of amenities. To fulfil their daily needs, residents can go to AEON Rawang Anggun, NSK Trade City and Giant at Rawang Mall. Other amenities that can be found here are eateries, petrol stations and car workshops. For medical attention, one can head to KPJ Rawang Specialist Hospital that is about an 18-minute drive away. The neighbourhood is also family-friendly, and you can find a few schools nearby such as SJK(C) Kota Emerald, SMK Taman Desa, SMK Seri Garing, SJK(C) San Yuk and Straits International School. In a nutshell, Chloe Residence is a well-chosen option for investment or personal stay. This neighbourhood does not only provide elegantly designed homes with a conducive environment but also equips you with seamless connectivity and a myriad of amenities. Interested? Click here to register your interest now! To inquire, call 1300 1300 16 or visit www.emeraldrawang.com. Additionally, new show units are now open for viewing. GuocoLand (Malaysia) Bhd, listed on the Main Market of Bursa Malaysia Securities Bhd, is the property arm of Hong Leong Group. The company is an established property developer in developing community-centric residential townships as well as innovative commercial and integrated development projects in Malaysia. It is a subsidiary of the Singapore-based GuocoLand Ltd, the multi-award-winning premier regional property player with established operations in Singapore, China, Malaysia and Vietnam.